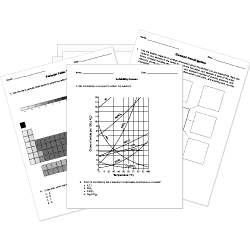 You can create printable tests and worksheets from these Grade 3 Chemistry questions! Select one or more questions using the checkboxes above each question. Then click the add selected questions to a test button before moving to another page. Two properties of matter are volume and . Which is these is NOT a state of matter? Which of the following is not an example of a physical change? any characteristics of matter that you can observe. the steps of the scientific process. A liquid has mass that can be measured. Which of the following is a solid? An object changes states from a liquid to a solid. It changes after the temperature gets colder. What is this called? Which of the following is a liquid? Which one is not a state of matter? You can change a solid into a liquid by melting it. It has a volume that stays the same, but it can change shape. What is it? Size and color are examples of . Volume is the amount of that matter takes up. is a measure of how hot or cold something is. Mrs. Wong leaves her bowl of ice cream on the sidewalk during a hot summer day. Which is the best prediction of what will happen to the ice cream? The ice cream will change from a solid to a liquid. The ice cream will change from a liquid to a gas. The ice cream will change from a gas to a liquid.